Danelle Im is competing as a member of Team Korea at the Winter Olympic Games. Danelle Im considers herself an unlikely Olympian. The daughter of Korean immigrants, Im fell in love with hockey while playing on the streets and rinks of Toronto with her brothers and other neighbourhood kids. As she sharpened her skills, she set her sights on a lofty goal - playing for Canada at the Olympics. The 25-year-old is currently living out her Olympic dream - though rather than the maple leaf, Im is proudly sporting the colours of her family's ancestral home while skating with Team Korea at the 2018 Winter Games in Pyeongchang, South Korea. "I felt very proud to be able to put on a Korean jersey, to come to this country and to play hockey, which is a sport I love and played in Canada," Im says during a telephone interview from the Korean team's practice facility near Seoul. While studying kinesiology at Laurier, Im (BA '15) helped the Golden Hawks women's hockey team win two Ontario University Athletics championships. The speedy forward also won a Provincial Women's Hockey League title with the Toronto Aeros, but she was realistic about her long odds of making the national team in a country rich with talented hockey players. "I just played hockey - I didn't consider myself an Olympic-level athlete," says Im. "This is not the traditional way that people reach the Olympics, and that's why it's so surreal." Im's road to Pyeongchang started when the Korea Ice Hockey Association noticed her success at Laurier and invited her to skate with the Korean national team in 2013. "I had no idea what this would lead to at all," says Im. "It was just an amazing opportunity for me to go to Korea for the first time." That first visit turned into several more summertime trips before Im moved to Korea to train for the Olympics. She joined a handful of foreign-born players recruited to bolster Korea's fledgling national hockey teams in time for the Games. The government fast-tracked citizenship for "imports" like Im, whose Korean heritage makes her eligible to play. "It's been a great journey. I'm just really thankful for this opportunity," she says. "I'm appreciating each moment." The Canadian brought valuable game experience to a young Korean squad that hasn't had much of it. "I've been privileged to play for such good teams and I learned a lot," Im says of playoff stints with the Aeros and Golden Hawks. "Being in a game situation, it's totally different than practices." Language can be a barrier in the dressing room, but Im said many of her teammates speak English and are good-naturedly tolerant of her "very poor" Korean. "We make it work somehow," she says with a laugh. "My teammates are really kind in that way and they make me feel welcome." Led by Canadian head coach Sarah Murray, the team practiced daily to prepare for the Olympics, tuning up with solid showings at the 2017 IIHF Ice Hockey Women's World Championship and the Asian Winter Games. "This team has grown an incredible amount over the past five years," says Im. "And our results have shown some improvement, which is encouraging." Pyeongchang is a long way from Waterloo, where Im excelled on the right wing with the Golden Hawks. She tallied 29 points in 98 regular-season games at Laurier, adding five playoff goals and one assist. The academic all-Canadian embraced the challenge of juggling sports and school. "My time at Laurier helped me grow a lot - not only as a player, but as a person," says Im. "And hockey was a huge part of that experience. 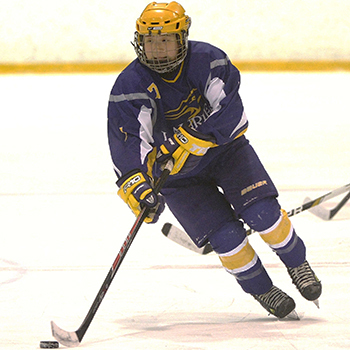 I was very grateful to have the privilege of being a student-athlete and play for Laurier." Im credited head coach Rick Osborne, set to retire this year after 15 seasons behind the Golden Hawks bench, as a formative influence on her. "He had coached a lot of OUA championship teams and I really trusted him and was thankful to be able to play for him," says Im. Osborne offers high praise for his former player. "She's one of the nicest kids I've ever coached and one of the greatest teammates anybody could have," says Osborne. Osborne says Im started out as a high-flying scorer, but developed into a role player who could hold her own on defence and be counted on to step up with the game on the line. "She adapted well and turned into a really nice role player for us," he says, calling Im a "difference maker" who scored three game-winning goals in her final year with Laurier. The coach says Im's ability to thrive under pressure will surely help her at the Olympics. "She's got a lot of skills and she works really hard," says Osborne. "She was just a really great Golden Hawk student-athlete." Im says she will look back fondly on the Olympics not only for what happens on the ice, but also because she forged close bonds with her teammates and got to explore her ancestral homeland alongside family from Korea and Canada. "It's been really, really amazing to be able to connect to my roots in Korea," says Im. "Hockey was a huge part of my childhood growing up in Canada. To come here and put on a Korean jersey is kind of connecting those things about myself - playing hockey and my Korean culture. That's really cool." Im was circumspect when asked her opinion about fielding one unified Korean women's hockey team made up of players from North and South Korea. "I can see the symbolic importance of this happening, but I do hope that the political decision-makers do think about all the hard work that all the South Korean players put in," she says. "Our goal stays the same, which is to play our best as a team." Following the Olympics, Im plans to play for Korea at the world championships in April before returning to Canada to complete her nursing degree at Ryerson University, where she has continued her university hockey career with the Rams. "It's hard for me to think about after the Olympics, but I do still have three years of school waiting for me," she says. The unlikely Olympian will leave Korea grateful for the chance of a lifetime. "I never thought that I'd get the opportunity to play in the Olympics, which is a dream," says Im. "But this gift, this opportunity that came, I'm so thankful and blessed."